Archaeologists in London study the skeleton of an adult male in his early thirties whose remains lay undisturbed for more than 500 years. Archaeologists excavating a site along the Thames Tideway Tunnel - a massive pipeline nicknamed London’s “super sewer” - have uncovered the skeleton of a medieval man who literally died with his boots on. "It’s extremely rare to find any boots from the late 15th century, let alone a skeleton still wearing them," says Beth Richardson of the Museum of London Archaeology (MOLA). "And these are very unusual boots for the period—thigh boots, with the tops turned down. They would have been expensive, and how this man came to own them is a mystery. Were they secondhand? Did he steal them? We don't know." 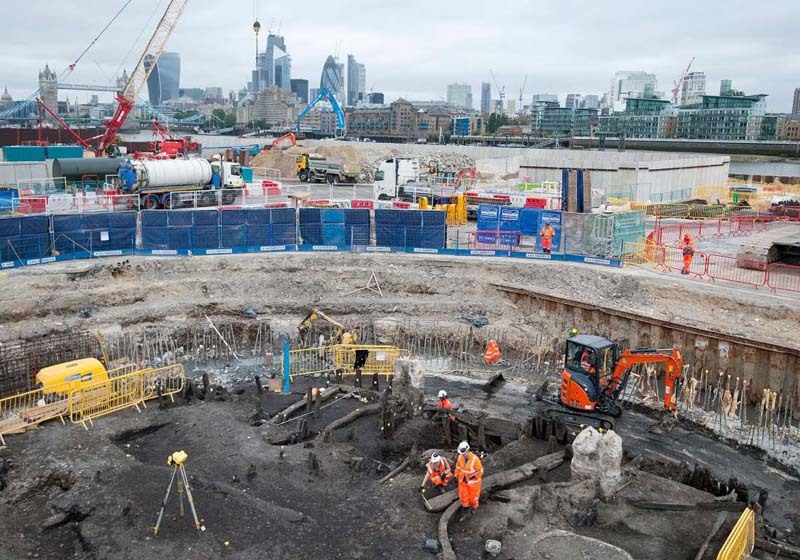 Unearthing skeletons during major construction projects is not unusual in London, where over the centuries land has been reused countless times and many burial grounds have been built over and forgotten. But archaeologists noticed right away that this skeleton was different. The position of the body—face down, right arm over the head, left arm bent back on itself—suggests that the man wasn’t deliberately buried. 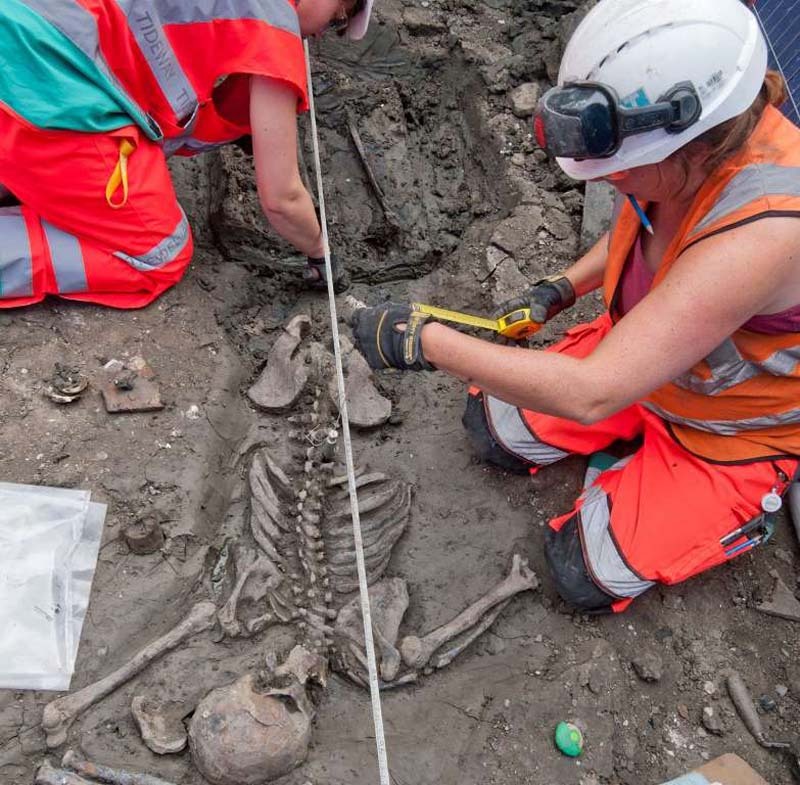 Archaeologists and specialists from the Museum of London Archaeology recover a 500-year-old skeleton during excavations for the Thames Tideway Tunnel. It’s also unlikely that he would have been laid to rest in leather boots, which were expensive and highly prized. In light of those clues, archaeologists believe the man died accidentally and his body was never recovered, although the cause of death is unclear. Perhaps he fell into the river and couldn't swim. Or possibly he became trapped in the tidal mud and drowned. Five hundred years ago this stretch of the Thames—two miles or so downstream from the Tower of London—was a bustling maritime neighborhood of wharves and warehouses, workshops and taverns. The river was flanked by the Bermondsey Wall, a medieval earthwork about fifteen feet high built to protect riverbank property from tidal surges. 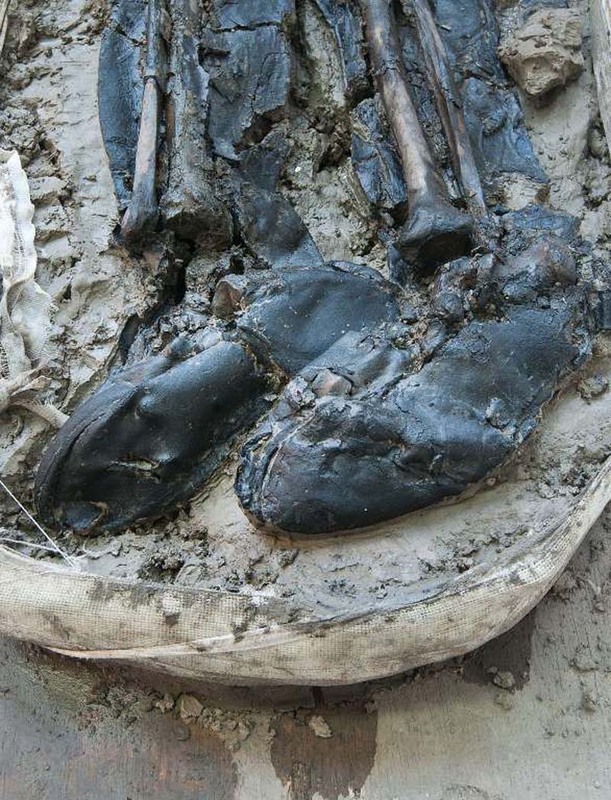 Experts dated the man's leather boots to the late 15th or early 16th century. Given the neighborhood, the booted man may have been a sailor or a fisherman, a possibility reinforced by physical clues. Pronounced grooves in his teeth may have been caused by repeatedly clenching a rope. Or perhaps he was a “mudlarker,” a slang term for those who scavenge along the Thames' muddy shore at low tide. The man’s wader-like thigh boots would have been ideal for such work. "We know he was very powerfully built," says Niamh Carty, an osteologist, or skeletal specialist, at MOLA. "The muscle attachments on his chest and shoulders are very noticeable. The muscles were built by doing a lot of heavy, repetitive work over a long period of time." It was work that took a physical toll. Although only in his early thirties, the booted man suffered from osteoarthritis, and vertebrae in his back had already begun to fuse as the result of years of bending and lifting. Injuries to his left hip suggest he walked with a limp, and his nose had been broken at least once. There’s evident of blunt force trauma on his forehead that had healed before he died. The investigation is continuing. Isotope analysis will shed light on where the man grew up, whether he was an immigrant or a native Londoner, and what kind of diet he had. "His family never had any answers or a grave," says Carty. "What we're doing is an act of remembrance. We're allowing his story to finally be told."